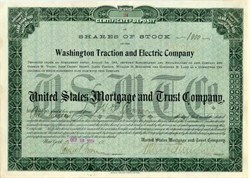 Beautifully engraved uncancelled Certificate of Deposit of Shares of Stock of the Washington Traction and Electric Company issued in 1901. This historic document was printed by the American Banknote Company and has an the company's name on top center. This item has the signatures of the Company’s Treasurer and Trust Company Officer. The Washington Traction and Electric Company was incorporated on June 5, 1899 as a holding company of the controlling interests in the Metropolitan; the Columbia; the Anacostia and Potomac River; the Georgetown and Tennallytown; the Washington, Woodside and Forest Glen; the Washington and Great Falls; and the Washington and Rockville railway companies, in addition to the Potomac Electric Power Company (PEPCO) and the United States Electric Lighting Company. The holding company had borrowed too heavily and paid too much for the subsidiaries and quickly landed in financial trouble. To prevent transit disruption, Congress on June 5, 1900, authorized the Washington and Great Falls to acquire the stock of any and all of the railways and power companies owned by Washington Traction. When Washington Traction defaulted on its loans on June 1, 1901, Washington and Great Falls moved in to take its place. On February 4, 1902, Washington and Great Falls changed its named to the Washington Railway and Electric Company, reincorporated as a holding company and exchanged stock in Washington Traction and Electric one for one for stock in the new company. The Certificate of Deposit of Shares of Stock was a part of the default and subsequent foreclosure of the company's holdings.